I've got quite a many projects I'd like to both tell you about and remember for my sake. Hopefully documenting my endeavours will make me realise how much I'm doing AND will make this blog my personal recipe book. 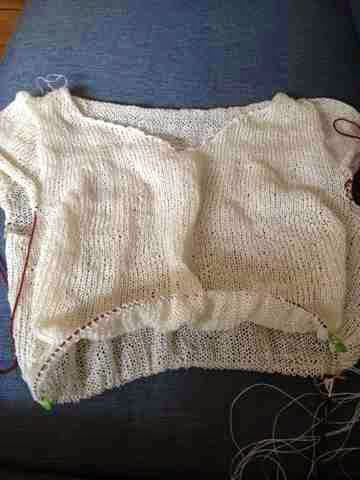 Today I have an aching back and while tending that I'm knitting away on a linen t-shirt. I'm using a free pattern from ravelry, ambiente, which is a top down shirt using the contiguous technique. Fortunately the larger size matched my gauge and size perfectly so I did'nt have to modify the base pattern. I AM adding bust darts and side shaping though as I'm rather shapely and need some structure to a garment to not look several sizes larger.